Senior WR Reggie Bell (#3) attempts to dodge three Princeton defenders during a big gain. Fresh off one of their biggest wins of the season, the University of San Diego Toreros (6-1, 4-1 PFL) travel to Des Moines, Iowa this Saturday for another critical Pioneer Football League contest with the Drake Bulldogs (5-3, 4-1 PFL). The Toreros will be looking for their six straight win while putting an end to Drake's 19-game PFL home win streak. 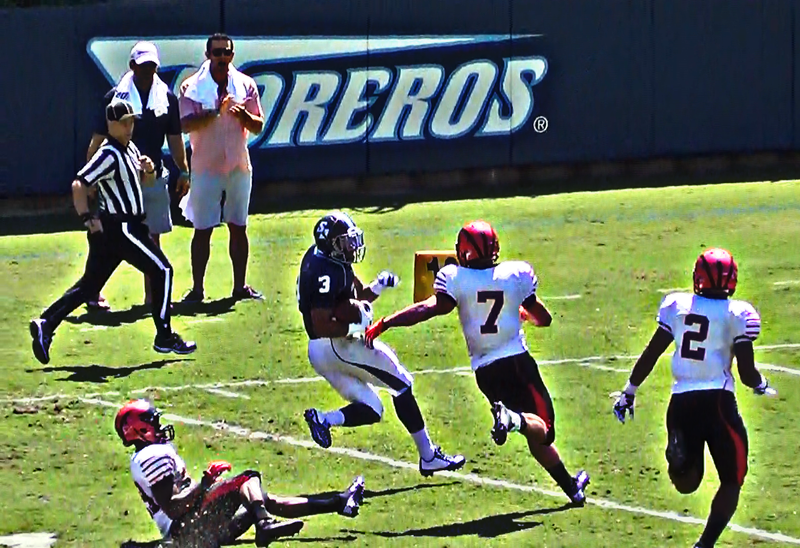 The last time these teams met was during the 2013 season-finale where USD picked up a 23-13 win at Torero Stadium. The Toreros lead the all-time series 11-10. For the second consecutive week, a Torero defender earned PFL player of the week honors. Following cornerback Jamal Agnew who picked up the award after a two interception performance at Butler, senior linebacker and safety Troy McClelland was given the honor this week after forcing two key turnovers during last Saturday's 40-29 win over Dayton.